Let he who has not watched that The Wicker Man YouTube compilation cast the first stone, as everyone’s been guilty of an ironic laugh at Nicolas Cage’s expense at one time or another. But now that Cage has begun the long march towards (re)legitimizing his career, perhaps it’s time for the guy who named his son Kal-El to laugh at us for a change. 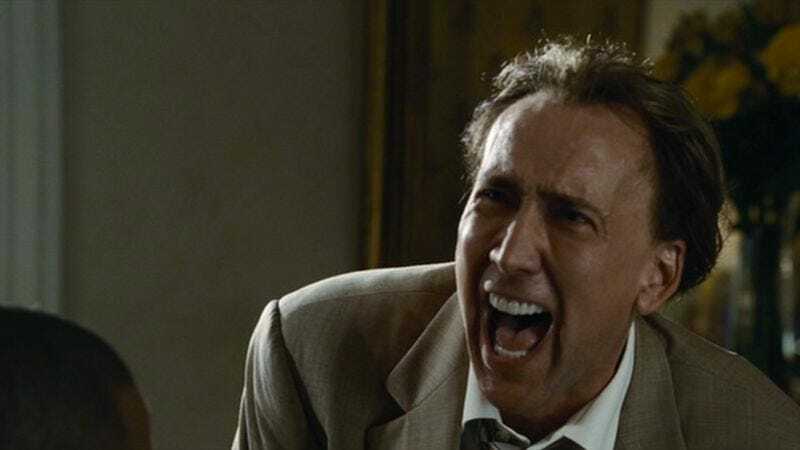 This isn’t the first time Cage has been honored with his own supercut, but “Every Single Nicolas Cage Laugh,” from YouTube user Mark Heiliger, stands on its own simply as a testament to the power of committing to one really dumb joke. Even Heiliger seems confounded by the scope of the twenty-minute supercut, which is exactly what its title says it is: a chronological collection of every single time Nicolas Cage has laughed in a movie, from the TV movie Best of Times (1981) to Rage (2014). Heiliger says he’s been working on the video for four months and that just exporting it took 16 hours; on his Twitter page, he declares himself “either a madman or a fool” for seeing the project through to completion. And for equally obsessive viewers who think they’ve spotted an omission, Heiliger even lists the movies in his filmography with “Zero Cage Laughs,” including Fast Times At Ridgemont High (1982), 8MM (1999), and The Frozen Ground (2013).